What can you do with your specialty shaped windows such as Arches, Angled, Circles and many others? 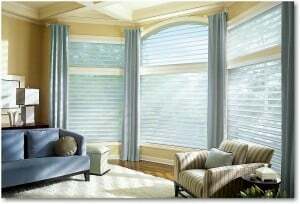 The good news is that we have many shades and blinds for you to consider for covering these type of unique windows. Many custom blinds & shades can be custom fitted into these uniquely shaped windows, but you’ll need to talk to one of our experienced window treatment specialists to find out the right treatment for you. These beautifully shaped windows can be challenging to treat, and they might have limited operation capabilities that need to be discussed for you to consider what’s right for you and your budget.